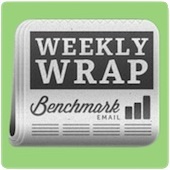 The Weekly Wrap: Benchmark FTW! Hope all of you have enjoyed Benchmark FTW as much as we did. If you didn’t win the Kindle Fire this time around, stay tuned! We’ll have another one to give away soon. So, be sure to pay attention to the blog, Twitter, Facebook, Google+ and Pinterest for more details. I would be lying if I said it was only the first time that I repeatedly flipped the pages back and forth in amazement on an online magazine. I do it every time. Especially on my iPad. Find out how you can leave your readers stunned and astonished with these Hot Trends: Digital Magazine Publishing Software. This post discusses the Streisand Effect and features a photo of a bear with the text “Bear Love Good.” That should be enough to convince you to come see who wins Charles Carreon vs. The Oatmeal: A Lesson in Web Etiquette. Pay attention, and maybe Facebook will offer you $1 billion. Guest blogger Lori McNee tells you the 5 Ways I Use Instagram & Pixlr-o-matic to Boost My Art Business. Because I’ve got it all in here (::points to head::) isn’t an acceptable answer, find out How to Choose a CRM System for Your Small Business. I get Matt’s plight in this post. Living by myself, it sometimes shocks me how long I can go without speaking out loud (please don’t send me cats). Thankfully, there’s TweetChat: A Water Cooler for the At-Home Parent. Yes. You can use Gmail for more than chatting with your friends all day long! Guest blogger Jessica Sanders tells you about Gmail: An Office Worker’s Best Friend. I mostly kept this post devoid of jokes. I know better than to try and top Louis CK: Comedian, Internet Entrepreneur Gives Fans What They Want. I read Rod’s remark that you can answer your phone with one swift movement. I’m hoping the user can decide the movement, and that most people go with the Chris Tucker and Jackie Chan dance from Rush Hour. Read about Angle: Your iPhone’s Bluetooth Headset Partner. Not sure if the blogger or social networking manager in me is more excited. Find out What the Facebook WordPress Integration Means for Bloggers. AKA the five must-have accessories for when there is finally (yes, finally) an Andy action figure. I won’t rest until this is a reality. Check out the Benchmark 5: Top Tech Tools I Can’t Get By Without.